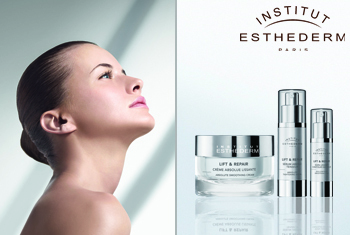 The Institut Esthederm Lift & Repair range offers a complete solution to your ageing concerns, lifting on the surface and repairing deep down. Targeting sagging skin and loss of facial volume, the restorative range gives skin a long-lasting lift effect whilst repairing structural changes deep down. The Lift and Repair range restores skin to its youthful capacity with results that can be seen and felt on application.